I love my skin. I’ve always been happy with it because it was very low maintenance for a good part of high school. 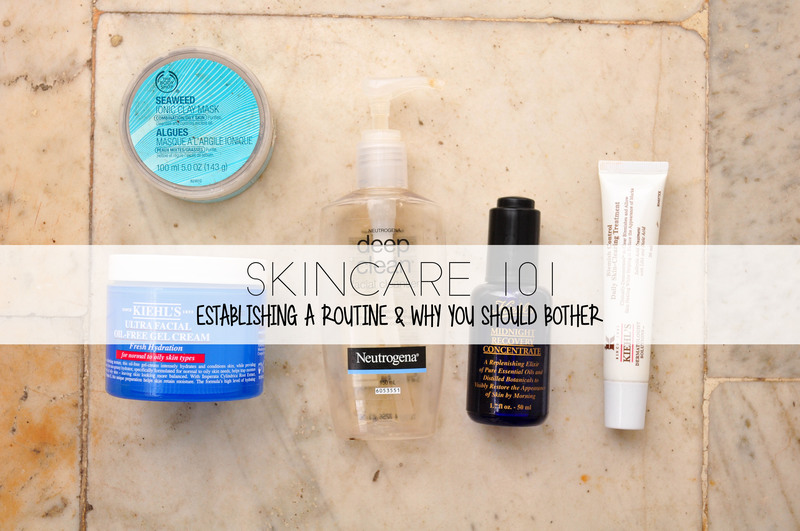 But breakouts turned up, and soon enough, I began to learn about skincare and how to set up a regimen that suits my skin. Scouring numerous beauty blogs & dermatologist interviews later, I managed to boil it down to an easy routine that has been relatively constant for the last two years. Today I’m going to walk you through my routine & give you ideas to establish one of your own, that addresses your skin type and works to clear any problems you might have. It takes time for anything to have an effect– so don’t get disheartened when your skin doesn’t immediately clear. It has to adjust to the routine, and that will take time. Keep at it for two weeks, and then decide whether you need to alter it. Not everyone’s skin is the same, so what works for a friend might not work for you. Don’t be afraid to experiment. Simple step 1: cleanse your skin in the morning post your shower. 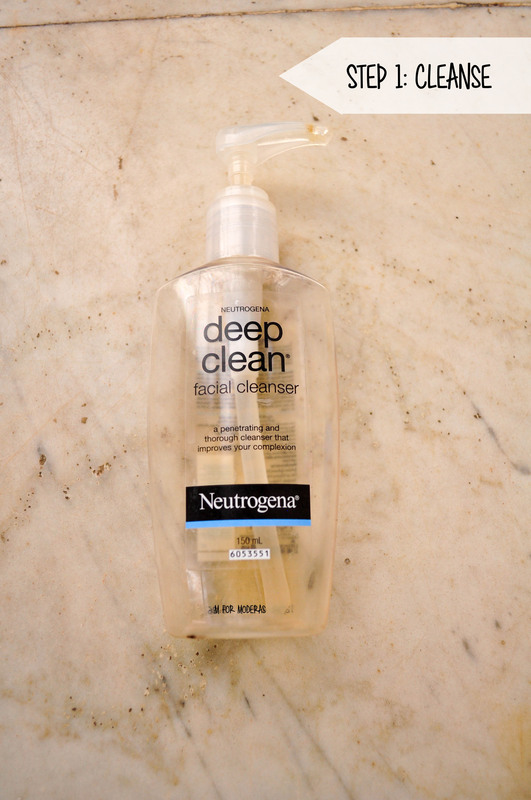 I swear by Neutrogena’s deep clean to get rid of product I applied for night time & provide a clean slate for the morning’s products. I use only this face wash for now, both in the morning and evening, and it does the job well. Dry your face with a soft towel/old t-shirt (genius hack). 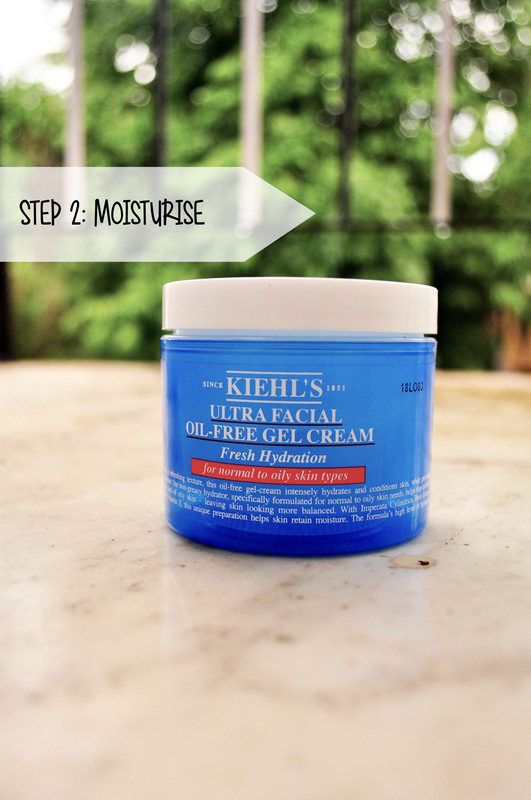 Step 2: moisturise. Now there’s a rumour that you shouldn’t moisturise if your skin is oily. Not true. Your skin secretes oil because it doesn’t get enough moisture. If you have oily/combination oily skin, choose an oil-free/gel formulation. Dry/normal skin, regular moisturiser will do. Apply a light layer moisturiser all over your face + neck within a minute of drying your face. A handy way to apply moisturiser is to apply two dots on your forehead, one on each cheek, one on the nose and one on the chin. This helps to not saturate your skin with product. Alternatively, you can also use a toner after drying your face. Toners work to make your pores (those weird bump-like things on your skin) appear smaller, and can also control oil. Apply some on a cotton pad, and swipe over your face. Moisturise after it dries. Make sure you let your moisturiser sink in your face before you apply any makeup. Sun protection is SO important, not because of potential tanning but the damage it causes to your skin. Prolonged sun exposure causes dark spots, pigmentation and ageing, which are hard to erase. I have yet to find a good sunscreen for the face that doesn’t leave an ugly cast/heavy feel on my face (and wallet). But I make it a point to apply a product with some amount of SPF every single day. BB cream & tinted moisturisers are godsends. I apply them with a sponge, which speeds up the process and eliminates chances of streaks, and I’m out the door in less than five minutes. Also make sure you use a good sunscreen for the rest of your body as well. Tons of spray ones are available on the market. 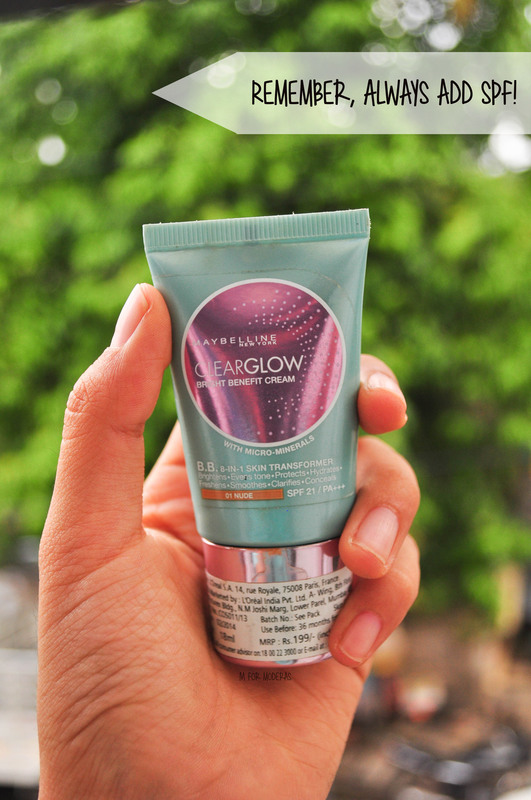 At night, it’s all about taking away the day’s dirt + makeup. After using a makeup remover (if needed), I wash with the same Neutrogena I use for the day. 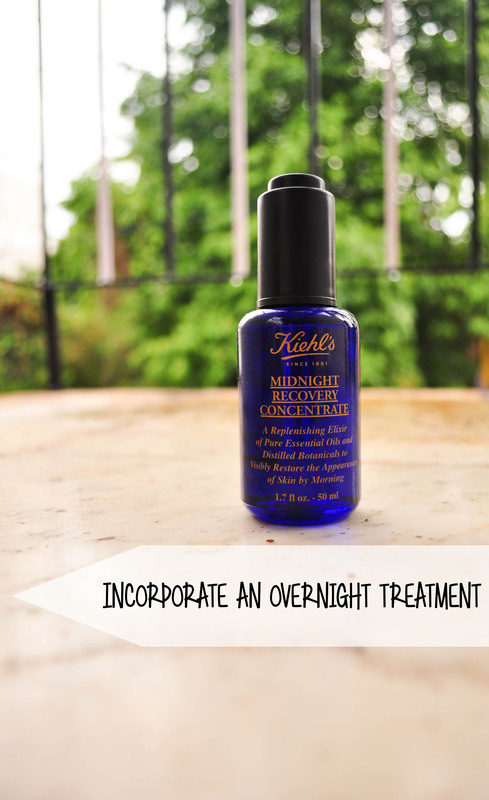 Then I use an overnight treatment– Kiehl’s Midnight Recovery Concentrate. This is one of their bestselling products, and for good reason– it works like magic. A few drops every night on clean skin makes pimple scars fade and my skin looks clearer. For example, if you popped a zit and got some skin hanging, use this. It repairs. Choose a product suited for night time. They have a stronger formulation than daytime products. L’Oreal, The Body Shop, and Kiehl’s have a good range. THIS. This is the step that works to tackle your skincare problems. And the trickiest step to nail. Now, we all have our own issues with our skin. Acne, for example, is a primary concern for most of us. But in our quest to get rid of our acne, we use a harsh acne face wash every single day. We don’t realise we’re stressing our skin out further. The solution? Alternate your regular skin treatment with a specific treatment. For me, the night time moisture/repair is alternated with an acne treatment. 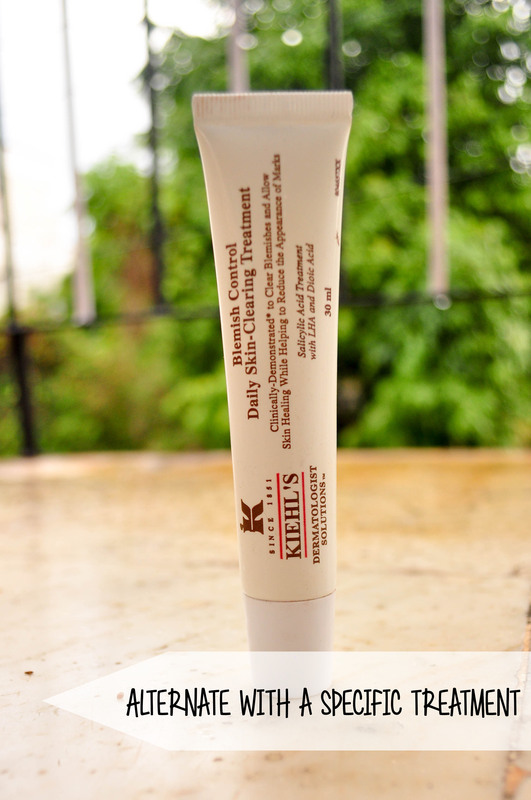 This product (again a Kiehl’s formulation) is pretty potent, and has salicylic acid, an acne-fighting ingredient. I can’t use this every day, it’ll make my breakouts worse. What do I mean by alternating treatments? I mean literally alternate. Choose three/four non consecutive nights to use specific products. I use acne products on Tuesdays, Thursdays & Saturdays, post a night time wash of my face. You can do the same, or try Mondays, Wednesdays, & Fridays. The point is to not use it every day. Alternatively, you could use an acne face wash (Body Shop Tea Tree face wash is amazing!) and a nighttime moisturiser to serve the same purpose. Exfoliation = scrubbing. This follows the same principle as specific treatments– moderation is key. Use a scrub/face mask once a week, preferably not on a day that you use the specific treatment. 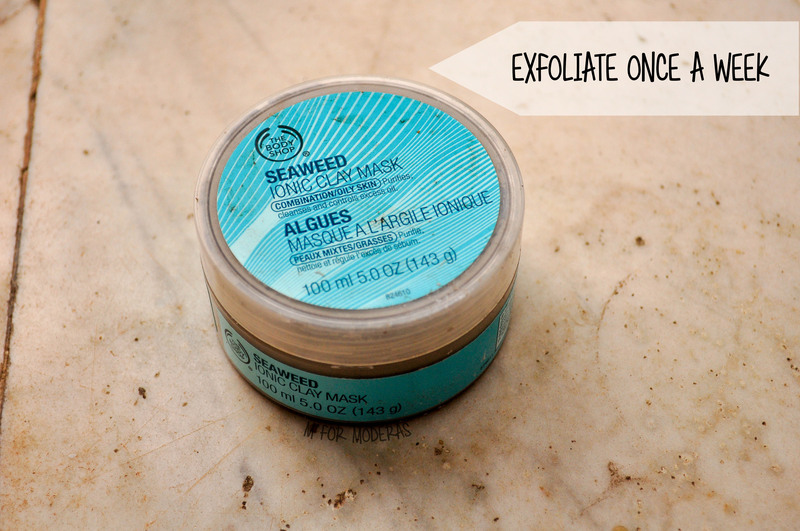 A mask really goes deep and draws out dirt from your skin– it’s not made for everyday use. Use a mask that is made for your skin type. Again, The Body Shop skincare range has something for everyone. So, this is my skincare routine in a nutshell. Skincare works best when you take care of your body from the inside out, so don’t forget to pile on fruits & vegetables, drink a lot of water, and practice some form of physical activity regularly. Good skin is always good to have, and an intelligent organ to invest in. It’s the first thing people notice, and caking on makeup is a time consuming process + useless when everything melts off your face in Chennai heat.